Dass Weihrauchprodukte schon immer und auch heute noch in anderen Kulturen, u.a. Ägypten, zur Behandlung von Husten und Verschleimung angewandt werden, kann man dort auf jedem Kräuterbasar erfahren. Auch beim Asthma bronchiale handelt es sich um eine Krankheit, bei der Leukotrien eine Rolle spielen. Sie bewirken dort Brochokonstriktion und Bildung von zähem Schleim, was besonders die Ausatmung behindert. A novel herbal composition containing extracts of Boswellia serrata gum resin and Aegle marmelos fruit alleviates symptoms of asthma in a placebo controlled double-blind clinical study. LI13109F is a novel herbal composition containing the extracts of Boswellia serrata gum resin and Aegle marmelos fruit. This composition dampens leukotriene dependent inflammatory reactions via inhibiting 5-lipoxygenase pathway. In a Sephadex LH-20 induced airway inflammation model of Sprague Dawley rats, LI13109F significantly reduced infiltrated granulocyte population in the bronco-alveolar lavage fluid and normalized Th1/Th2 cytokine balance. Further, a 56-day placebo-controlled and randomized double blind study (Clinical Trial Registration No. CTRI/2016/10/007393) on subjects with mild to moderate asthma has evaluated the clinical efficacy of LI13109F. The study subjects received either 200 mg/day of LI13109F (n = 18) or a similar dosage of placebo (n = 18). At the end of the trial period, LI13109F conferred significant improvements in the clinical parameters; the emotional function (p = .0305) and asthma symptoms scores (p = .0002) were improved even at 14 days, compared with the placebo. Further, 56 days supplementation of LI13109F resulted in significant increase in serum IFN-γ (p = .0014) and reduction in IL-4 (p = .0497), compared with placebo. LI13109F supplementation did not yield any serious adverse events or any abnormal observations in routine laboratory examinations during the study. Together, these observations suggest that LI13109F (AlvioLife®) is tolerable and an effective intervention for management of mild to moderate asthma such as airway inflammation. Medicinal Plants for the Treatment of Asthma: A Traditional Persian Medicine Perspective. OBJECTIVE: To search major Traditional Persian Medicine (TPM) textbooks for medicinal plants used to treat asthma. The conformity of the TPM findings on the anti-asthmatic efficacy of plants with the findings of pharmacological studies was also explored. METHODS: Major TPM textbooks were hand searched to find medicinal plants used for the treatment of asthma. Scientific names of TPM-suggested plants were determined using botanical databases and were used for a multidatabase electronic search in PubMed, Scopus, ScienceDirect and Google Scholar databases. Then, the antiasthmatic effectiveness of TPM-recommended plants was verified in view of the findings from modern pharmacological investigations. RESULTS: According to the main TPM texts, Adianthum capillus-veneris, Boswellia oleogumresin, Crocus sativus, Glycyrrhiza glabra, Hyssopus officinalis and Ruta graveolens were the most efficacious medicinal plants for the treatment of asthma. This finding was confirmed by pharmacological studies which showed counterbalancing effects of the above-mentioned plants on inflammation, oxidative stress, allergic response, tracheal smooth muscle cell constriction and airway remodeling. CONCLUSION: The strong ethnobotanical background of plants used in TPM could be a valuable tool to find new anti-asthmatic medications. In this review, TPM-suggested anti-asthmatic plants were found to possess several mechanisms relevant to the treatment of respiratory diseases according to the information retrieved from modern pharmacological studies. This high degree of conformity suggested further proof-of-concept trials to ascertain the role of these plants in the routine management of asthmatic patients. OBJECTIVE: The combination of inhaled corticosteroids (ICS) and long-acting beta-agonists (LABAs) is recommended for the treatment of patients with mild-to-severe persistent asthma. However, given the lack of definite and safe therapies, complementary or alternative medicines are frequently used by asthmatic patients in combination with standard treatments. PATIENTS AND METHODS: A group of asthmatic subjects have been enrolled in this multicenter study; after having verified the compliance to their current medical therapy (ICS + LABAs), the subjects have been randomized to receive Casperome® 500 mg/day or no additional treatment for a period of 4 weeks. They were also asked to keep track of the number of inhalations required per day and any adverse events through a daily form. RESULTS: A total of 32 subjects were enrolled in the study. Subjects receiving Casperome® 500 mg/day in addition to the standard ICS + LABAs treatment showed a decrease in the number of inhalations needed compared to patients who did not receive Casperome® therapy. The treatment was well tolerated and only mild-moderate adverse events were registered. CONCLUSIONS: The use of Casperome® 500 mg/day is beneficial for asthmatic patients as it helps reduce the need for inhalation therapy with ICS + LABA. Eur Rev Med Pharmacol Sci. 2015 Oct;19(19):3757-62. A 61-year-old man complained of cough and dyspnoea after exposure to colophony-containing solder fumes at work. A histamine challenge test confirmed airway hyper-responsiveness, and colophony-challenge demonstrated a 16.7% drop in peak expiratory flow rate (PEFR), supporting a diagnosis of colophony-induced occupational asthma. At review, the patient presented with cough, dyspnoea and wheeze that occurred acutely when exposed to the fumes from burning incense during Easter Saturday services, necessitating his departure from the church. Inhalation challenge tests using two blends of incense used at his church (Greek and Vatican) led to identical symptoms and a significant reduction in forced expiratory volume in 1 s 15 min after exposure and PEFRs up to 48 h after exposure, indicating an early and late phase asthmatic reaction. This is the first report of coexistent colophony and incense-induced asthma. The similarities in chemical structures between abietic acid in colophony and boswellic acid in incense suggest a common mechanism. BMJ Case Rep. 2014 Mar;2014():. Natural anti-inflammatory products and leukotriene inhibitors as complementary therapy for bronchial asthma. OBJECTIVE: To assess the efficacy of a combination of Boswellia serrata, licorice root (Glycyrrhiza glabra) and Tumeric root (Curcuma longa) as natural leukotriene inhibitor, antiinflammatory and antioxidant products respectively in controlling bronchial asthma. SUBJECTS AND METHODS: The study comprised 63 patients with bronchial asthma that are further subdivided into two groups .Group 1 receiving oral capsule (combined herb) in a soft-gelatin capsule 3 times daily for 4weeks and group 2 receiving placebo. Plasma leukotriene C(4) (LTC(4))(,) nitric oxide (NO) and malondialdehyde (MDA) levels were measured and pulmonary function was also assessed in all patients enrolled in the study. RESULTS: There was a statistically significant decrease in the plasma levels of LTC(4), (MDA), and NO in target therapy group when compared with placebo group. 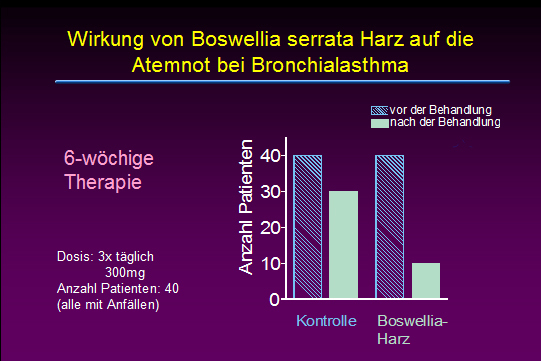 CONCLUSION: The used extract contained Boswellia serrata, Curcuma longa and Glycyrrhiza has a pronounced effect in the management of bronchial asthma. The gum resin of Boswellia serrata, known in Indian Ayurvedic system of medicine as Salai guggal, contains boswellic acids, which have been shown to inhibit leukotriene biosynthesis. In a double-blind, placebo-controlled study forty patients, 23 males and 17 females in the age range of 18 - 75 years having mean duration of illness, bronchial asthma, of 9.58 +/- 6.07 years were treated with a preparation of gum resin of 300 mg thrice daily for a period of 6 weeks. 70% of patients showed improvement of disease as evident by disappearance of physical symptoms and signs such as dyspnoea, rhonchi, number of attacks, increase in FEV subset1, FVC and PEFR as well as decrease in eosinophilic count and ESR. In the control group of 40 patients 16 males and 24 females in the age range of 14-58 years with mean of 32.95 +/- 12.68 were treated with lactose 300 mg thrice daily for 6 weeks. Only 27% of patients in the control group showed improvement. 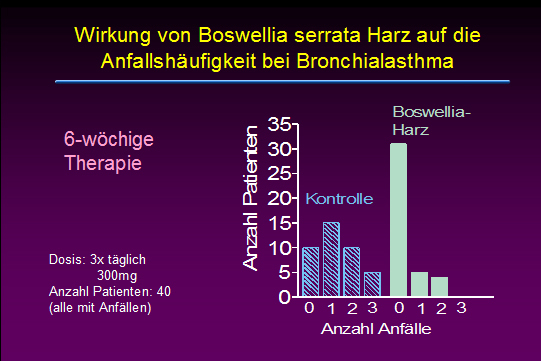 The data show a definite role of gum resin of Boswellia serrata in the treatment of bronchial asthma. Eur J Med Res. 1998 Nov;3(11):511-4.